Content – What Role Should it Play in the Sales Process? This is a third in a series of programs that discusses how a new CMO introduces Revenue Marketing to her new company. It will air live Thursday, January 5, 2017 at 10:30 am Pacific. 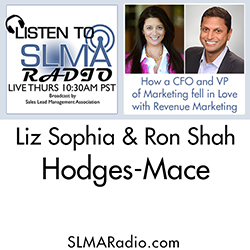 In the first interview on SLMA Radio we interviewed Liz Sophia and her CFO Ron Shah with the program title of: How a CFO and VP of Marketing fell in Love with Revenue Marketing. Ron seemed to be impressed with the concept that marketing can create measurable revenue. The relationship had gotten off to a great start, but both parties said it was still too early to measure a tangible success. Is the Love affair between the CFO and the VP of Marketing still alive? 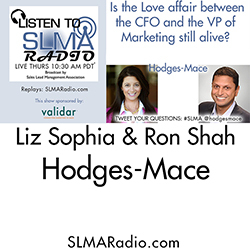 In May of this year we interviewed Liz Sophia (VP of Marketing and Ron Shah CFO) of Hodges-Mace to discuss the progress that Liz was making in introducing Revenue Marketing to the company. One of Liz’s first moves in the fall of 2015 was to enlist the support of the CFO. They agreed in the interview that while huge progress had been made with the salespeople, new qualified leads, more accountability, etc., the jury was still out on how Revenue Marketing would fully become the sales and marketing rallying cry for the company. Let’s hear the progress that Liz and Ron have made and see if the love affair with revenue marketing is still an affair to remember. The host is Susan Finch. 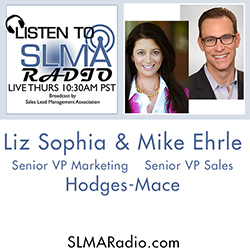 Liz Sophia joined Hodges-Mace as Senior Vice President, Marketing in September of 2015. Her expertise is helping marketing organizations become revenue centers by adopting today’s most innovative concepts and technologies including: lead generation, sales-marketing alignment, content marketing, revenue performance management, and marketing automation. Liz is a savvy digital marketer with a firm grasp on lead generation and lead management to enable the sales function and drive revenue. Her diverse background includes agency and client-side experience primarily in the technology sector. She has worked with companies of all sizes from startups to global corporations, always in positions of increasing responsibility. Areas of expertise include: agency selection and management, marketing automation, revenue performance management, online strategy, employee development and brand transformation. She is a marketing thought leader and 100% committed to helping drive change and transform marketing from a cost center to a profit center. Prior to Hodges-Mace, Liz was the Chief Marketing Officer for North Plains Systems. Prior to that role she held senior leadership roles with Sage and Pgi. Profiled in award-winning book, Rise of the Revenue Marketer. Liz holds a Bachelor’s of Arts degree in Communication from Hollins University. Ron joined Hodges-Mace as Chief Financial Officer in October 2011, and he is responsible for overall financial management of the Company. Prior to joining Hodges-Mace, Ron served as Chief Financial Officer for PhyTest, a leading provider revenue cycle management services for physicians. He previously spent eight years as an investment banker, assisting growth-oriented companies on capital raising, merger & acquisition and strategic advisory transactions. In addition, Ron also worked as a management consultant, working with clients to implement operational improvement and information technology-related initiatives. Ron holds a Bachelor of Science degree in Finance from Babson College and a Master of Business Administration degree from the University of Virginia. Founded in 2004, the company’s strategy remains the same: work with fewer, larger clients than our competitors, so that we can dedicate the best resources to each client. Ultimately, our high-touch service philosophy and thorough approach to solving our client’s challenges translate to an exceptional customer service experience.